At 8300 feet in elevation, this 3 mile wide, 800 foot deep Amphitheater rests on the edge of the Paunsaugunt Plateau, basking in the early morning light just after a snow storm breaks over the region. Millions of years of wind and water erosion have carved colorful Claron limestones into thousands of delicate spires, pinnacles and arches. Collectively called "hoodoos", these unique formations are whimsically arranged and tinted with colors too numerous and subtle to name. The native Piute Tribes referred to this land as "Unka-timpe-wa-wince-pockich", which means "red rocks standing like men in bowl shaped canyon." The legend says that a long time ago, a group of people moved into the area and made a coyote angry with their bad behavior. The coyote put a curse on the people, now called "Legend People", turning them to stone. Many modern day visitors that have heard the legend, say they can see the images of people sitting, standing and holding each other, when they gaze upon this natural wonder. 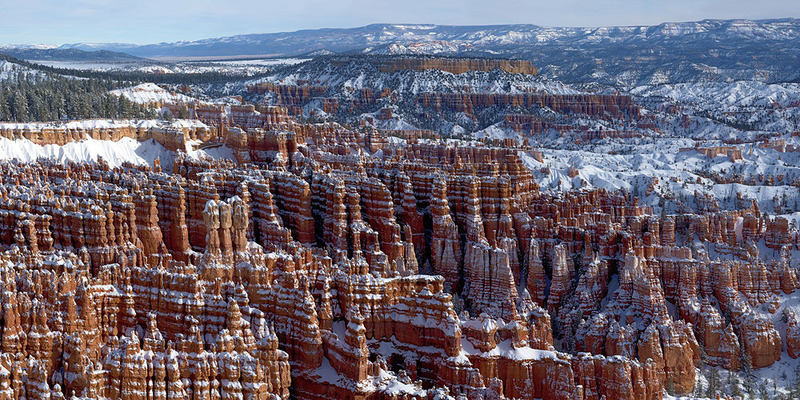 Bryce Canyon was given it's "American" name when Mormon settlers came to southern Utah in 1874. A homesteader, named Ebenezer Bryce, built his home where the park's lodge stands today. His neighbors began referring to the area as Bryce's canyon, and the name stuck. Reports say that when Bryce was asked about his thoughts on the canyon he replied, "It's a heck of a place to lose a cow." In 1928, Bryce Canyon was enducted to the National Park service, becoming Bryce Canyon National Park.